Precisely when we are lost and in need of both telephone and toilet Max turns up from nowhere and asks if we need some help before we have had the time to ask him. The hospitality among the volunteers helping the WSF participants is warm and friendly. And there are plentiful in sharp contrast to the European Social Forum in Malmö were lack of volunteers caused severe problems. 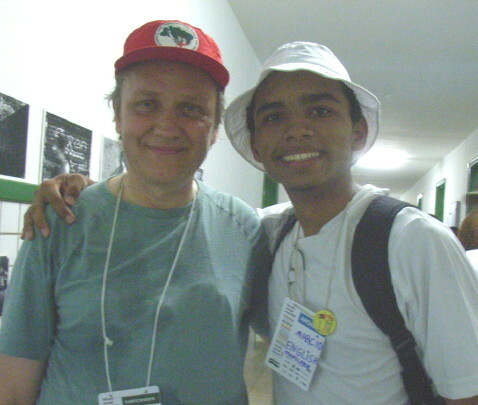 I give Marcio an ESF badge and tells him it is a gift to him and all the WSF volunteers for all the great job they are doing. Than I want to tell him that he shall tell the other volunteers that the commitments from so many people to help the participants voluntarily is really good compared to a European country as Sweden. He cannot listen to this message. He is so focused on getting a message that tells him what he can do to help so he cannot at first understand that the message is to honour him and is volunteer friends. When he finally understand his face get red. He is proud of recieving the ESF badge. Unfortunatly I cannot upload the photo now. The chaos with lack of printed correct information, cancelled activities or the sheer obstacles in finding the many different places at two separated university campuses is creating great problems as always, or maybe even more. But it is all in a humid antivirtual atmoshpere. Everywhere are umbrellas, in the hands of people, tied to the bicycle or simply constantly used in the form of the hatumbrella protecting you all the time leaving both hands free. It is a double purpose tool of utterly usefulness as it is either hot sun burning you without the umbrella protection or rain making you wet. From the rain forest which start 5 meters from the main track through the campus at many places the sound of animals, hopefully birds, can get overwhelming. The signs states things clear, watch out poisonious animals. The temparature is all the time 28 degrees, sometimes a little bit more, sometimes a little bit less. Every day it rains. Drops of water that are unimaginably soft. That leaves no feeling of coldness directly nor after a while as rain in Northern Europe. It simply rains for a while and then it is over and you soon get dry again if you are not having an umbrella on top of your cap. Time disappears. There is no way anyway to advance faster along the only path through the rural university campus. The Youth camp have this time been put centrally in this campus with many activities and the path is invaded by people having a good time, dancing with each other looking at people perfoming avery kind of street theatre or just chatting for fun or because you meet someone you have not met for ages. The border between your warm fluid body, the warm fluid air and other warm fluid bodies disappears. Trying to maintain your practical priorities becomes impractical. You are lost if you do not find the small tricks to get away. The best instead of the endless walk along the main path to get to the main actvitity area is to go down to the river through a stretch of rain forest and take a small riverboat protecting its passengers with a roof but no walls to the other university campus in a less huge space but with more localities for actvities. At the river there are no houses on either side and you suddenly are in the Amazon basin with its many rivers. You are lost again in an eternal world of humidity, this time liquid under you. Far away there might be a modern city like Belem. But it is hard to know.